Deep in the Grand Canyon, away from the well-known South Rim, sits an area of the park with waterfalls that could rival any in the world in terms of beauty and power. It’s not exactly a quiet spot, but it’s certainly off the beaten path and takes more than a little effort to reach. The striking color of the falls is created by naturally occurring large amounts of calcium carbonate in the water, forming limestone that lines the creek and creating a beautiful white and blue-green contrast. The creek and the falls are constantly changing, and it’s easy to see why the the people who live there consider them to be sacred; their spiritual strength. The water and falls are certainly renewing and inspiring, but are also place that deserve respect and care. When the alarm buzzed at 3:30 a.m., I was not looking forward to the day ahead. The howling wind blowing all night combined with my nerves meant I had barely slept, and the next 18 hours included a three hour drive and a 10 mile hike in the Arizona heat. I grabbed my backpack and slowly snapped out of my sleepy state. The group of ten, some friends, some strangers, gathered in a grocery store parking lot so folks could buy their last minute supplies and necessary morning coffee before venturing into relative isolation. We were headed to Havasupai Falls in the Southwestern corner of Grand Canyon National Park, and as we pulled into the parking area known as Hualapai Hilltop along with the rising sun, I was finally excited about the adventure ahead. In order to stay overnight at the falls, you must first secure a reservation, which can be difficult to get. My friend secured her reservation almost a year in advance. The good news is that up to 10 people can join in on the single reservation. The keeper of the falls are the Havasupai people, or Havasuw ‘Baaja (people of the blue green waters), who have long inhabited the canyon and many of which now live in the nearby Supai village. 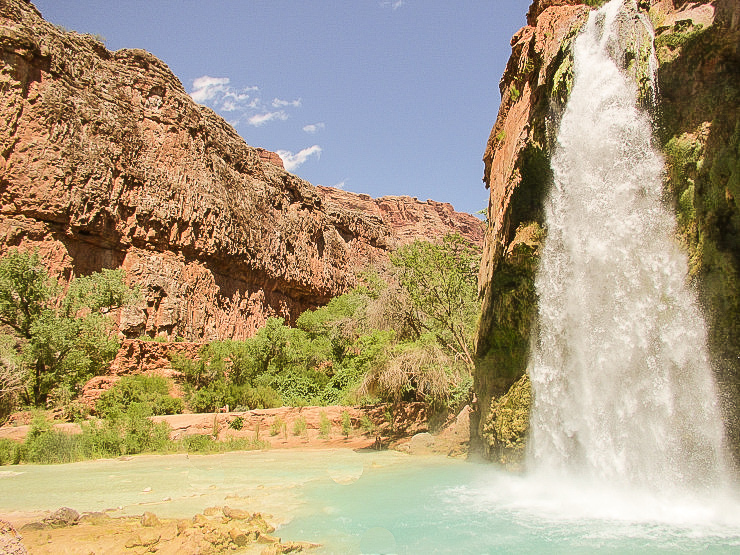 The Havasupai Tribe has 639 members, many of whom work for the Tribe, particularly tribal enterprises such as tourism. 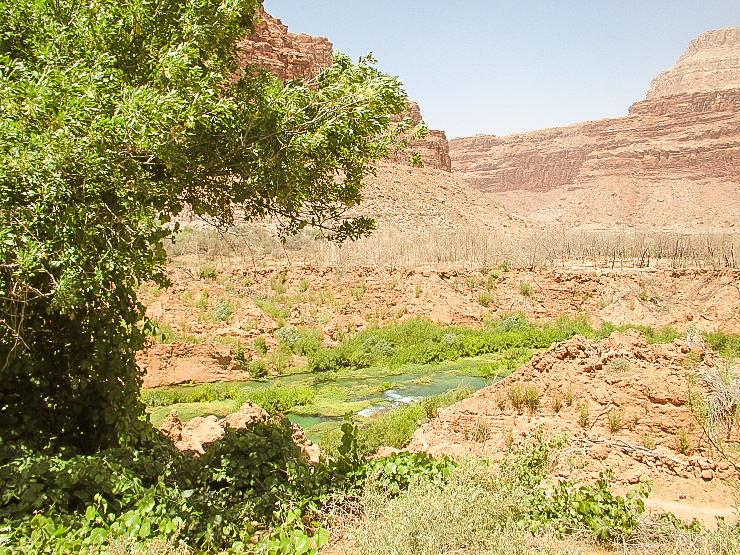 About a third of the tribe members live in Supai, which can only be reached by foot, mule, or helicopter. The remoteness that comes with being eight miles from a road can certainly be felt. Despite that, hoards of hikers still pass through the town daily, as the inhabitants of the town go about their lives. There is a school, a community center, and a small store and lodge. The wind was still gusty as we set out, but as we quickly descended, the canyon walls shielded us from the strong breeze. The first mile was steep, but the next seven miles to Supai were a gradual, steady descent with pleasing, if not dramatic desert landscapes to view. The hike itself was long, but doable for a moderate hiker, even with the entire contents of the impending weekend on my back. The day heated up quickly, hence the early morning departure. That Arizona sun is nothing to scoff at. 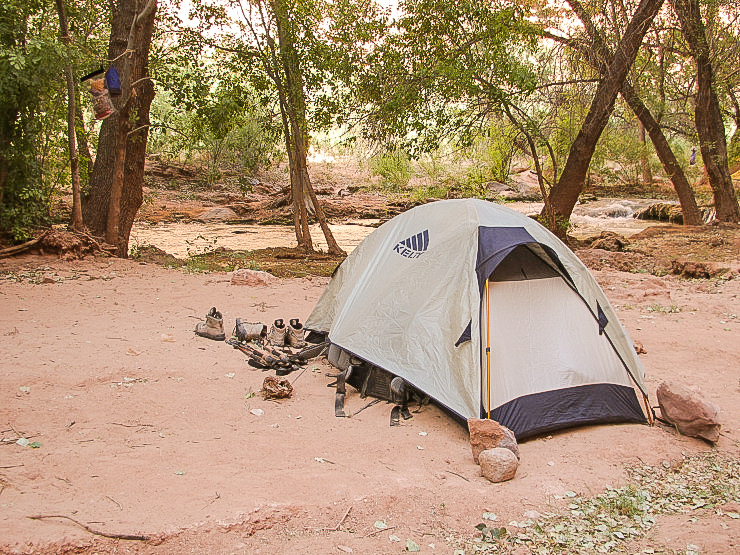 From Supai it’s another two easy miles in a lush area of the canyon to reach the campground. The first falls we came to were the Upper and Lower Navajo Falls of Havasu Creek. These used to be one set of falls, but a 2008 flood rerouted the river and created a new flowing pattern. I could hear it before I saw it. 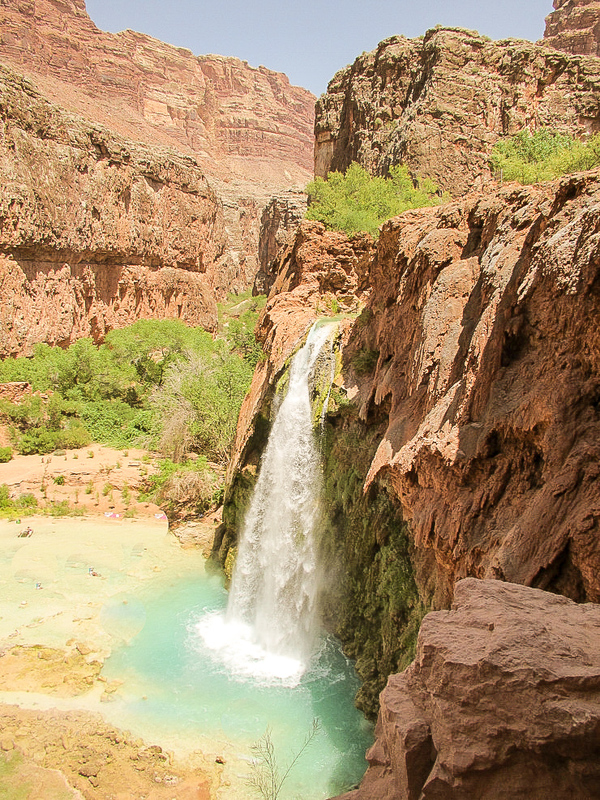 The truly grand Havasu falls. I knew at that moment that the trek had been worth it. The 100-foot falls pours into a huge swimming pool, the perfect place to cool off. As the trail continues, the immense campground comes into view, with the creek flowing through. Despite the huge number of visitors, the campground is big enough that we still found a spot that provided some relative peace. Once we set up camp, I hung my hammock and didn’t move for a while. At the far end of the campground is the short trail to Mooney Falls, a 210-foot misty giant of a waterfall. But, reaching the falls is not for the faint of heart. Descending to the bottom of the falls requires scaling a rickety, exposed wall with a few built-in hand grips. If it’s rainy or stormy, skip Mooney Falls and stay in your hammock. Beyond Mooney Falls, it’s possible to hike another few miles through the creek to reach Beaver Falls. And eventually, in another five miles or so, the Colorado River awaits. Despite the fear I had heading into this trip, or the moment of sheer panic I felt while climbing the ladder back up from Mooney Falls, the effort it took to get there made it all the more worthwhile. The Grand Canyon offers something new with every visit, and just as the layers of rock form the canyon, there are layers upon layers to be unraveled in this wonder.